Years can be kind, weeks can be rough. Days may vary from hour to hour, minute to minute. The one constant is that time marches on. Sometimes it feels like we’re under its boots and other moments like we’re riding a wave. 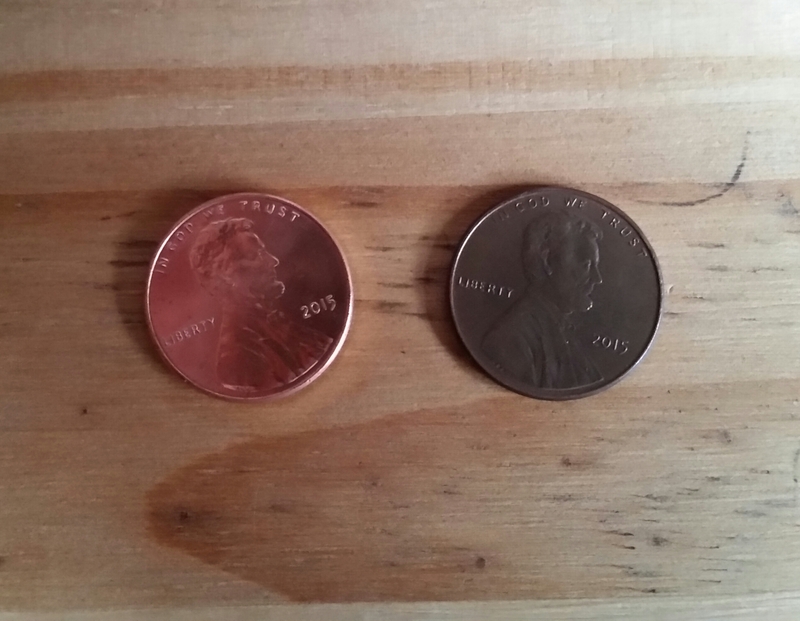 Yesterday I was sorting through coins and noticed two 2015 pennies that looked like they came out of different decades: one is bright and the other has long since lost his sparkle. What did that dull one ever do to deserve the disgrace of non-shininess? Did one of these pennies get put through the wash or dropped on the ground more than normal? Or maybe the luster was rubbed off because it was someone’s lucky penny—constantly handled and cherished. There’s no way to tell one story from the other just by looking at them and they are both worth the same, no matter what. P.S. This is my 200th post. Many thanks for following my journey. A contest is coming soon, so be on the lookout. It appears there’s been a flare-up in the war between SAHM and working moms. I could list facts about all the work devoted mothers do from their homes—both for their children, spouse, and others—but it’s all been said before. Or I could mention the documentation that’s been done showing that SAHMs are worth over $112000 a year for the work they do. Wouldn’t that be nice, especially since I homeschool there’d be probably be even more compensation. But it seems like the attacks on Ann Romney are more of the “class warfare” that’s spreading like a disease the past several years. So-and-so paid less taxes than those working below them. Don’t up the tax percentage based on income—make taxes the same percentage for all so the people making a million will be paying more than the people who make thirty thousand. The tax codes are broken so please don’t begrudge those who have been successful—look at the motives behind those who wish to tell others what to do with what they have. Whenever I say never I usually break my own rule or find an exception to the rule but the following are pretty much set as absolutes for me now. 1.NEVER trust people who name “Lucy” as their favorite Peanuts character. 2.NEVER judge a parent because his/her child is screaming/etc in a public place. If you feel the need to judge, check how the parent is REACTING to the child. 3.NEVER leave pens unattended—even for a few seconds—while a toddler is in the room. 4.NEVER rely on your memory once you hit twenty-five—write everything down. 5.NEVER allow your checking account to get below $10. 6.NEVER leave a bag of bird seed outside over-night. 7.NEVER walk for a prolonged period on cement in the summer while barefoot. 8.NEVER assume your husband will feed the children while he’s babysitting. 9.NEVER forget that the habits you despise in other people are usually those you have, too. 10. NEVER go against a Sicilian when death is on the line. Okay, so I borrowed the last one. I just love that movie… if you don’t know what it is you’re missing something! Tell me your experiences regarding these topics and add your own, too. Be sure to let me know if you want me to expand on any of these on future blogs.